Food Costs > How Much Does a 12 Pack of Soda Cost? How Much Does a 12 Pack of Soda Cost? A 12 pack of soda, one of the most common forms of soft drinks purchased at a local grocery store, come in all sorts of flavors from many big name soda companies. In most cases, the cost of a 12 pack varies from one store to another and the brand. Name brand soda is going to always cost a lot more than the store brand. In most areas, a 12 pack of soda is going to cost anywhere from $2 to $6 without the deposit if the state charges it. According to this forum thread on BabyCenter.com, members here stated that a 12 pack of soda in their area ranged anywhere from $4 to $6. Kmart.com, for example, lists 12 packs that range anywhere from as little as $2.69 for a store brand to as much as $5.25 for a name brand like RC Cola. Even though you can get a deposit back, many states apply a bottle deposit to the total order. This is usually either $0.05 or $0.10 per can, which can equate to $.60 or $1.20 for a 12 pack. 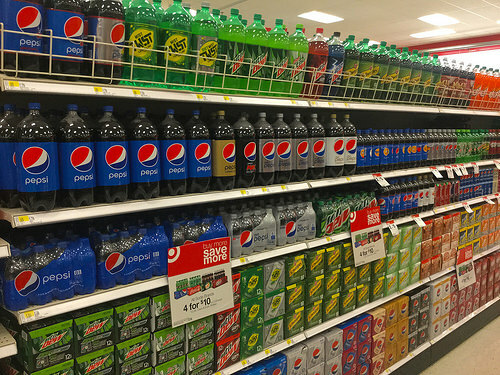 Some states will charge a special tax on sugary beverages. This fizzy drink often contains water as the main component, and in most cases, the water will be carbonated and flavored to offer it a sweet taste with preservatives and color additives. Sometimes, caffeine and artificial coloring will be included, either individually or as a combination of the two. Every flavor will have its own unique ingredients. Increased consumption of carbonated beverages can result in health problems such as tooth decay, obesity, bone diseases and kidney stones. Therefore, moderate use is advised. Always buy your soda at a local grocery store. Convenience and liquor stores often tend to mark up prices by more than 40 percent. A bottle deposit is designed to encourage recycling. If your state charges a bottle deposit, it is refunded to you when you take back the cans. If you pay $1.20 in a bottle deposit, this whole amount will be refunded to you. Return the cans at your local grocery store (there will be machines that will take them back for you) and you will be given a receipt. Take this receipt to the counter or cashier and the amount will either be given to you or taken off your total grocery bill. Soda can be purchased in many different forms; a 12 pack of cans is only one option. You can purchase different sized bottles as well, including 16.9-ounces, 20 ounces, or a 2-liter. Some people prefer bottles over cans since they are closeable. Bottles can be purchased individually at gas stations or grocery stores or they can be purchased in 6- or 8- packs. The traditional can of soda contains 12 ounces; however, smaller cans can be found in packs of eight. Just like many other items, buying the drinks in larger quantities will be cheaper than buying them in smaller packages. For instance, buying a 24 pack is going to be a lot cheaper than a 12 pack. If you have a membership to a wholesale club, consider buying here to maximize your savings. At Sam’s Club, for instance, a 35-pack of Coca-Cola retails for about $11. Keep your eyes peeled for sales or even coupons at a local grocery store as many stores will have sales on name brand products. For example, a 12 pack of Coca-Cola can be on sale for 4 for 10. Also, most stores rotate the sales between different brands. If you are not picky, you can just buy whichever brand is on sale that week. Look for coupons or special deals from brands that you enjoy. These coupons can be found on the official company’s website or even by following them on social media. If you are not loyal to a particular brand, consider a store brand soda, which can be up to 40 percent cheaper. Even though the taste may be slightly different, it can still crave your soda craving. If you want to have fun and maximize your savings, consider making your own soda at home with SodaStream. This gadget will cost you less than $100 and the refills cost about $5 to $15 each. 2-liters are often the cheapest route when purchasing soda in general.